What is included in rental rates? What do we look for in a property? Why farmhouse and villa rental? Aside from the choice of villas itself, we offer guarantees that all will go smoothly throughout the entire booking process leading up to the actual rental. The website is designed to be very informative, the descriptions of houses detailed and honest and reliable. We'll help you choose the right villa for your needs & budget, and safely help you through the booking process, with reliable methods for paying the 25% deposit to secure the booking. We then provide you with detailed directions to the house and Google Earth photos that make is impossible to get lost. Our Insider's Guides tell you all you need to know about the area, from restaurants, shopping, entertainment & historic sites, and describe in detail 10 different routes for day trips throughout the region. Since 1997, I (Charlie) have visited well over 300 properties and we currently have what I consider an excellent catalogue of rental houses . Through the years, we have narrowed down our catalogue to a manageable 25 properties of different sizes and price ranges. I have stayed overnight at least once in every single house we offer, but very often these are houses that I go to often with friends and family. I think this is very important as you don´t really know a house until you have stayed there and used all the facilities. I myself have taken many of the photos and movies you see in website. Needless to say, we are very choosy about the properties we work with and we work hard with the owners to maintain high-standards and keep up with the times, like adding internet ADSL and WIFI to most houses. We want problem-free houses that feel like real homes. We don't want any complaints from guests. Our reputation is on the line with each rental, and guests have our phone numbers where we can be reached 24/7. We don´t want to be disturbed with complaints, so working with a problem house or problem owner is out of the question. Again, the properties we work with are the best we can find in their category & price range, and in most cases, we have been working with the house for well over 10 years now, so they are time-tested and true. Every so often we add a new house, usually at below-normal rates in order to get started and get in some of those all-important (and genuine!) testimonial emails from past guests. Our Comment's Pages are un-doctored emails, sometimes quite long and detailed, sent in from past guests. I think the Comment's Pages are an excellent peer to peer supplement to my info on each property, and I thank those who have taken the time and effort to write in! Our Insider's Guidebooks to the area. Throughout the years, I (Charlie) have been collecting travel info on the where-to-go’s and what-to-do’s in each region, including shopping, restaurants, entertainment, recommended beaches & historical & natural sites of interest. The guidebook I have been working on since 1997 for Girona and the Costa Brava is already 94 pages long (of A-4 size paper and no illustrations - all text!). This is without a doubt the most substantial guidebook to the Costa Brava anywhere and a loan-copy of this guidebook is provided at each rental property, or I can email this to you as a .PDF file so you can read it before your rental. Parts of this guidebook are offered in the house listing under the heading Travel Info on this Area. We coordinate your arrival and meeting with the owners of the house. If you are arriving late, after shops are closed, we can do a shopping for you so that you have dinner and breakfast waiting for you upon arrival. Many houses offer cooks and cleaning help whose services you can arrange through me, or directly with the owners on an ad hoc basis while you are here. Fees are about 10 to 12 Euros per hour, minimum 3 hours, including transport to the house. I also have a line on several caterers for special meals for larger groups. I've also handled weddings and larger gatherings, only in the off-season, and I have a line on catering, decorators, photographers, dj's, etc., but only in the off-season. Ours is a small cottage industry (sorry!) - just my wife Maria and me, and a little help from our webmaster friend Claus in Oslo. 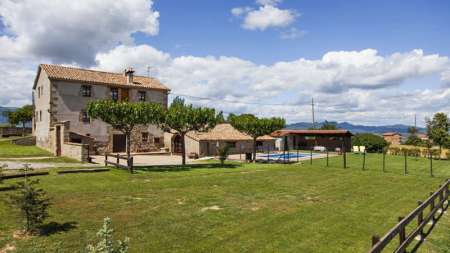 Back in the early 90´s we discovered "turismo rural" or rural tourism - the renting of rural farmhouse properties for weekend and holiday getaways. Back then there weren´t many places to choose from, but we fell in love with a few houses, and more importantly, we got to know what parts of Catalonia we liked and didn´t like. We were very much taken with the Costa Brava and the Pyrenees. On the other hand, we didn't like the Costa Dorada to the south and inland from Barcelona. It is just too hot and dry in summer, the beaches too built up Miami beach-style, and the train tracks run parallel to the coast, an unsightly barrier often with smelly underpasses to get to the beaches. In 1997, Charlie (a US ex-pat, 45 years overseas, 28 years in Barcelona as of 2016) and María (from Galicia, northwest Spain, but raised in Germany) decided to try presenting a handful of houses in what was then a new medium called internet!I still remember our first website on geocities.com.Anybody remember them!It was such a primitive website but we reckoned that local owners needed English-speaking representatives to present the houses, and you, the house hunter, needed someone you could trust locally to tell you which properties are worthy.The next step was to explain how to go about securing the booking in a safe and reliable and inexpensive manner. Slowly, by the year 2000 or so, the bookings started coming in quite regularly and María and I both quit our other less-interesting jobs to dedicate ourselves to this. After looking at our house listings, email or call us to let us know which property or properties are of interest to you. If you can´t decide, let's work together to narrow down the choices according to you requirements.We can do that by email or on the phone, and I use Skype for cheap calls. I am always very frank and honest about the houses.NB: I can be even more brutally honest on the phone than in writing!Once we have found the right place for you, we´ll put the house on hold and then send you all the booking info you need to pay the 25% deposit the owners require to hold the booking. All deposits are sent to the owners directly, except VISA or MasterCard charges which I take care of for the owners. In all cases, the balance due is either payable well ahead of your arrival date, or in cash upon arrival, when the owners hand over the keys. Yes, all properties are in hands of private owners or caretakers - not rental agencies. This is an important distinction. Agencies couldn't care less about their guests or the houses they offer. House owners need to care about both, and part of our job as far as the owners are concerned is finding the right sort of guests for their particular property.In that regard our work benefits both home owners and holiday makers. As always, the early bird gets the worm, and some of our most popular villas are fully booked for peak dates as early as 12 to 18 months before the rental. Certainly by Christmas, most of the villas should be for all of the following high-season. If you see a house that is of interest to you, I suggest you ask me to put it on hold, then check with your family and friends, consider the options, and then get back to me when you are sure of your choice. In the off-season last minute bookings are most welcome but can be quite difficult to find as owners often have Barcelonan weekend bookings. Aside from the new tourism tax, which is 50 cents per adult per night and helps protect you from fraud in the holiday rental sector, all prices quoted in the website property listings are 100% all-inclusive, and there are no hidden or extra charges of any kind whatsoever. Prices include taxes and all utilities, cleaning before and after your stay (and a free cleaning & linen change after each week for two or three week rentals), clean high-quality 100% cotton bed linen and bath towels and kitchen towels, a full range of kitchen utensils, and most often some start-up foodstuffs in the kitchen. If there are any extras, such as the electricity for air conditioning, or tokens for a sauna or Jacuzzi, I make this very clear in the presentation and in my booking texts. All houses are fully prepared for immediate occupancy, and there shouldn´t be anything (within reason) that is lacking to diminish your comfort. Washing machines, for example, are standard issue, but most houses nowadays also have dishwashers, internet, satellite or digital TV in English, a games room, and lots of little extras, like hairdryers in the bathrooms. The written description of each property makes it clear exactly what is on offer in each house. In two words I guess we are looking for comfort and charm. 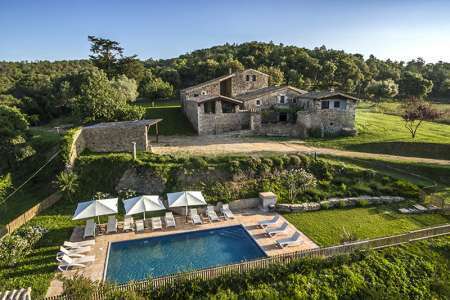 In almost all cases, the properties we offer are traditional Catalan farmhouses, called masias, some well over a thousand years old, which have been lovingly restored and offer amenities ranging from standard to luxurious. However, keep in mind that our "standard" is very high, on a par with what others call luxurious. (Luxury is a word and a concept I personally have problems with. I don't believe in it!) If there is something slightly quirky or odd about a property, I will make that clear in my presentation. The masias usually have thick stone walls (keeping the house cool in summer and warm in winter), elegant wooden ceiling beams, stone arches, terra cotta floors, antique furnishings, fireplaces, fairly modern & practical kitchens, and most houses are situated on large private properties with private pool and gardens with an outdoor bbq dining area. Some of these properties are huge. I will send you Google Earth photos with GPS information so that you can see them from space and visit the area for yourself - always a good thing to do before choosing a rental. I've seen too many houses listed in other websites that I have rejected due to proximity to a highway or, on one memorable occasion, I visited a "luxury villa" right next to an active sawmill!I do not represent villas that have small gardens and immediate neighours. Aside from the quality of the property itself, there are minimum requirements that all our properties must fulfill. For example, I insist on quality 100% cotton sheets on new mattresses, and no sagging old beds! Continental bed sizes are traditionally quite small (135x180cm the double) but I am having owners replace these with a much larger 150x190cm size mattresses. Each bedside must have reading lamps: one lamp for a single bed, two lamps for a double. In the write-ups I will give you bed sizes for each room. All houses must have large common and sitting rooms with fireplaces, television, internet, CD/radio/cassette players, and the kitchens must be fully equipped, including washing machines, dishwasher, oven and hob and microwave and smoke extractor. All houses must have outdoor BBQs and seating and dining areas, with electric lighting for nighttime al fresco meals. All pools have plenty of lounge chairs and usually a shower and a WC, so that you don't have to go indoors to go. All houses are especially well suited for children, although not all pools are fenced for child safety. My kids are young but I still prefer an unfenced pool. Why are the villas I offer inland and not on the coast? The coast, by definition, is hot and humid, even at nights. In the summer months it is practically impossible to sleep at nights on the coast without using lots of A/C. 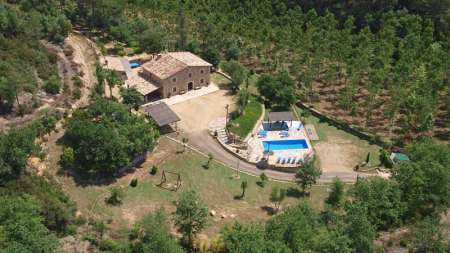 That is why all the moneyed Catalan's have summer houses up in the hills, far away from the busy coast, which is completely left to the tourists. The coast is a great place to visit, and getting there is part of the fun, taking back roads to a different beach every day and I highly recommend sightseeing along the way. My 94-page Guidebook will help you discover things along the way and help you avoid any traffic jams. Yes, the Coast is a great place to visit, but you wouldn't want to live there! We want to take the guesswork and the hit & miss out of choosing a rental villa near Barcelona. As go-betweens (between owners and renters) we are very pleased with the way things are going, both with guests and owners. The rate of repeat or return guests is very good, averaging about 10% to 12% per year, and that seems to be going up. I often get emails saying "Last summer was great. What do you recommend for this summer?" We are also very satisfied with our current catalogue of rental properties. Some properties have come and gone (let´s face it, there is an attrition rate in this business, and some owner's do eventually "burn-out", not being able to keep up with guest -and our- requirements). But the future looks bright, and like I said, María and I have pretty much given up all other professional activities and we are dedicated to doing this until our kids are grown up and we retire. That's an incentive to get it right! Again, be sure to read the Comment´s Page for each property. Some guests send in some very thoughtful and helpful testimonial emails, and some of them are as informative about the property as my own written description of the villa. The rental part of your holidays may be "our job", but receiving a nice letter at the end of a rental is very rewarding. There are hundreds of these in the website. I hope you will be writing in one day yourselves to acknowledge a job well done and a house well worth recommending! mass tourism is an abomination - just look so much of our coasts! the weather is better too!